On September 14, 1985, residents of the Polish city of Toruń watching the popular James Bond ripoff 07, Call In (in which a blond and ideologically correct Citizen's Militia officer fights crime from within a series of tight sweaters) were surprised to see the show briefly overlaid with block white letters reading "Solidarity Toruń: Boycotting the election is our duty," and "Solidarity Toruń: Enough price hikes, lies, repression". Twelve days later, the same slogans appeared superimposed on the hated evening news. The dissident radio astronomers had struck again. You can see a recreation of the broadcast (and experience the exciting production values of advanced socialism) in this brief YouTube video. The doctored images could only be seen over a small area of central Toruń, but they caused a sensation. The police caught the perpetrators after the second screening. Jan Hanasz, Zygmunt Turło, Leszek Zaleski and Piotr Łukaszewski served four months in jail for the stunt. While looking for a key to the numbered items in the photo, I learned that the apparatus had been built by a Professor Eugeniusz Pazderski, who is still alive and well and teaching at the University of Toruń. I sent Professor Pazderski a brief email asking for technical details about the transmitter, and in response received a most wonderful letter, which Prof. Pazderski has graciously allowed me to translate and publish in full. In the second half of the 1970s, the observatory where I work joined the elite club practicing the extremely difficult and costly technique called Very Long Baseline Interferometry (VLBI). The basic idea is that you can observe a radio source in the sky using a number of radio telescopes on different continents as if they were a single radio telescope 10,000 km in diameter. This requires superprecise atomic clocks so that each station will keep the same time and local oscillators in the radio receivers can maintain a constant phase difference across observatories over long time scales (~1000 seconds). Today we use GPS satellites for global clock synchronization, but back then we had to use television broadcast frame signals. We would convert a television receiver to extract the frame signal and measure how many microseconds elapsed between a one second tick of our atomic clock and the nearest frame signal. We did this using signals from the transmitter in Poznań, our colleagues in Borowiec near Poznań would pick up the frame signals from Poznań and Berlin, astronomers in Potsdam would catch the signal from Berlin and Munich, and the ones in Munich from Munich and Paris. In Paris there was a reference clock that all of the observatories in Europe tied into, and this in turn was synchronized somehow with the reference clock in Washington. So right under our nose we had a television with an externally exposed synchronization signal. When we found out about the underground Solidarity radio broadcasts during martial law, we figured why just do radio, why not do television? We couldn't broadcast on our own frequency, because for one thing you needed an audience, and for another it would have required a lot of power, which is hard to conceal. We had to broadcast on the same frequency as official programs and ensure ourselves a large number of viewers by piggybacking on popular films or series, overlaying our own texts over the official images. To do this with a low power transmitter and have good range we couldn't emit a complex video signal, but only pixels of text at appropriately calculated time intervals relative to the vertical and horizontal synchronization signals. We discussed such a solution at the Astronomical Observatory in Piwnice (more precisely in the Department of Radioastronomy), essentially just three people, Bogdan Wikierski, Andrzej Kępa and me. At a certain moment Jan Hanasz came to see me and asked whether I would be able to build such a device. I replied that I could make a transmitter, but that I would have problems building the digital interface, since the only ZX Spectrum available to me in the department was occupied day and night by colleagues (more for fun than for work), so I wouldn't be able to conceal my particular interest in that computer. Back then I wasn't very expert at digital devices either, so I preferred that someone else do it. I only worked on the transmitter at night, when there was no one else in the observatory building. 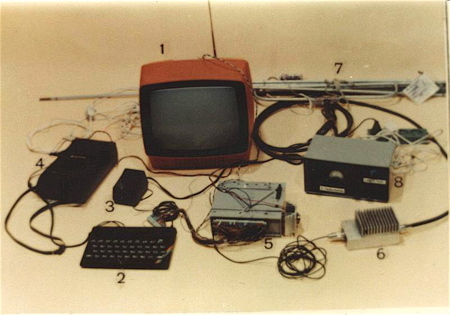 It consisted of a carrier signal generator (around 50 MHz, channel 1 of Polish television), as well as a multistage class D amplifier. When in use the transmitter would only connect to the amplifier when the driving signal from the digital interface was in the 1 state. I had serious problems tuning the amplifier, since I did not have an artificial load with a dissipative power over 5 W. The one I used would overheat badly, so I had to tune very quickly in order not to destroy it - it was the only one in the observatory and I would have trouble if it were damaged. Haste dictated that I tune the amplifier with the lid open, which did not serve my health. In any case I achieved an output power of 7 W, which I estimated would allow for the signal to reach Toruń and environs. Jan Hanasz would sometimes stop by, which made me suspect that someone else was working on the digital component at the same time. Knowing the capabilities of my colleagues as well as certain social ties I suspected it was Zygmunt Turło, but I never discussed the subject with Jan. I would just pass along certain suggestions, for example that the text on the screen should continuously change position, so that a clever policeman would not be able to calculate where the transmitter was by triangulating the signal1. At a certain moment everything was ready, I gave Jan the transmitter and considered the matter finished. The stress that came from the risk of detection went away. Some time later I happened to hear people talking about how text had appeared on TV screens in Toruń. Unfortunately I didn't see it myself. I had left on a month-long official trip to the observatory in Holland, where for 250 guldens (all my spending money) I bought myself a ZX Spectrum so that I could have my own computer for any eventual further underground work. Some time later one of the Dutch radio astronomers, a friend of mine, was supposed to visit Poland. I was in charge of organizing his visit, so I went one day to see my fellow astronomers in Torun to pass along the date and topic of our Dutch guest's seminar. One of the people I visited was Jan Hanasz. As I was walking out of his office, some girl looking at an Art Department exhibit on the same floor as the astronomy offices took my picture. This was a little puzzling but it didn't make me uneasy; after all, who understands artists! That same evening right after 8:00 PM I saw the Solidarity TV logo on my own television screen. I was bursting with pride, but I also felt very uneasy. And with good reason, since around midnight four plainclothesmen and a uniformed policeman knocked on my door. They spent several hours ransacking my apartment - doing it so quietly that neither my wife or my kids woke up. They found cassettes with ZX Spectrum programs on them and underground publications, they also took my computer. In the end they made me wake up my wife to find out what she had in her sofabed. My dear late wife behaved very courageously, no panic, she asked for her dressing gown, got off the sofabed and then only watched as the sad men led her husband off to who knows where. I spent about 40 hours under arrest in my precinct in the company of a bandit who had robbed priests in their parishes and an activist from the Union of Socialist Youth who had stolen pornographic video tapes from the cultural center2. Every once in a while they would call me in for interrogation, asking about underground television and radio as well as about my colleagues from the observatory (I didn't know that they had been arrested). I did not admit to anything, I said that I barely knew my colleagues because I lived in Piwnice, 12 km north of Toruń, while they lived far away in the center of the city. After the Security Service was done interrogating me a man from military intelligence took over, trying to get me to collaborate. I didn't show any enthusiasm; gently but firmly I refused. Finally after two days they let me go. I returned home to the great joy of my wife. During my absence, Mr. Antoni Stawikowski visited my wife; he was an astronomer and regional leader of Solidarity in Toruń. He handed her 5000 zl3 and told her where I was as well as which lawyer she should turn to. To this day I don't know how to give him back that money! It turned out not to be necessary after all! After several months my colleagues under arrest regained their freedom. Not long afterwards Jan Hanasz reached me again. I had prepared additional documentation on the transmitter for him in hopes of starting mass production of the transmitters. He had gotten his hands on an artificial 50 W load for me as well as transistors of comparable power. I started building a prototype of a new transmitter that could reach the entire district (Jan Hanasz has it now) with a tunable carrier wave generator so that it could be used anywhere in Poland or neighboring countries. The Round Table talks [in 1988] made me stop work on this, but I kept my activities a secret for five more years, just in case. During the last years of the previous regime I also thought up an undetectable radio communication scheme for Solidarity. By that point I could write assembler and build computer interfaces in my sleep, so the number of people required for these kinds of undertakings would have been very limited. It was supposed to be just a couple of words, but it came out pretty long. You'll find documentation on the web pages mentioned above. 1. The idea here is that if the text remains immobile on the screen, a smart cop (like Agent 07) could synchronize his detector in time with one of the "on" pixels in the text, which would repeat at a constant offset from the end of a blanking interval and make it easier to home in on the perpetrators. If the text moved around, this offset would change and triangulating the signal would be much harder. Considering that a typical Polish secret police agent had the IQ of a fish stick this is complete overkill, but it illustrates nicely the dangers of oppressing a Polish radio astronomer. 3. About a week's salary.